Hobby Lobby To Forfeit Smuggled Iraqi Antiquities : The Two-Way The company says its passion for historical Bibles and other artifacts led to "regrettable mistakes." 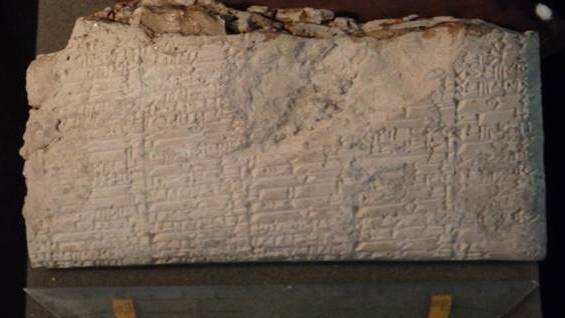 It will pay a $3 million fine for improperly importing items such as ancient clay tablets. Cuneiform writing on a clay tablet improperly imported into the U.S. by the Hobby Lobby company, which is forfeiting thousands of items. Updated at 10:20 a.m. ET Thursday. The announcement by the Justice Department says Hobby Lobby bought over 5,500 artifacts, such as clay tablets and blocks with cuneiform writing, and cylinder seals for $1.6 million. The artifacts, originally from Iraq, were shipped to the company from the United Arab Emirates and Israel with labels that described them as "ceramic tiles" or "clay tiles (sample)." In a statement, Hobby Lobby President Steve Green said the company "was new to the world of acquiring these items, and did not fully appreciate the complexities of the acquisitions process. This resulted in some regrettable mistakes." "We should have exercised more oversight and carefully questioned how the acquisitions were handled," he said. But the Justice Department prosecutors say the company should have realized that its acquisition of the artifacts "was fraught with red flags." In the announcement by Bridget M. Rohde, Acting United States Attorney for the Eastern District of New York, says that in October 2010, "an expert on cultural property law retained by Hobby Lobby warned the company that the acquisition of cultural property likely from Iraq, including cuneiform tablets and cylinder seals, carries a risk that such objects may have been looted from archaeological sites in Iraq." The expert also told Hobby Lobby that the government could seize artifacts with "an improper declaration of country of origin for cultural property." Green said the company has adopted internal policies for importing cultural property and "is pleased the matter is resolved." He added that Hobby Lobby's interest in acquiring historical Bibles and other artifacts "is consistent with the Company's mission and passion for the Bible." For years, Green has been building a eight-story, $500 million museum in Washington, D.C., called the Museum of the Bible, to house his collection of tens of thousands of artifacts. The museum is slated to open this November. A previous version of this post indicated that the artifacts were shipped to Hobby Lobby from Iraq through other countries. In fact, according to the Justice Department, the items were already in the UAE when Hobby Lobby agreed to purchase them.